This decadent, five ingredient Dark Chocolate Buttercream Frosting takes just five minutes to prepare. You’ll never stray towards the aisles of canned frosting again with this recipe in your back pocket. Friends, step away from the cans of frosting lining grocery store shelves. I mean, does anyone actually like that sickeningly sweet stuff anyway? Instead, I’m here to share with you my signature Dark Chocolate Buttercream Frosting. Much more delicious than anything store bought and so incredibly easy. You’ll wonder why you ever bought that canned stuff! And believe me, you won’t think twice about doing it again. Just five ingredients. 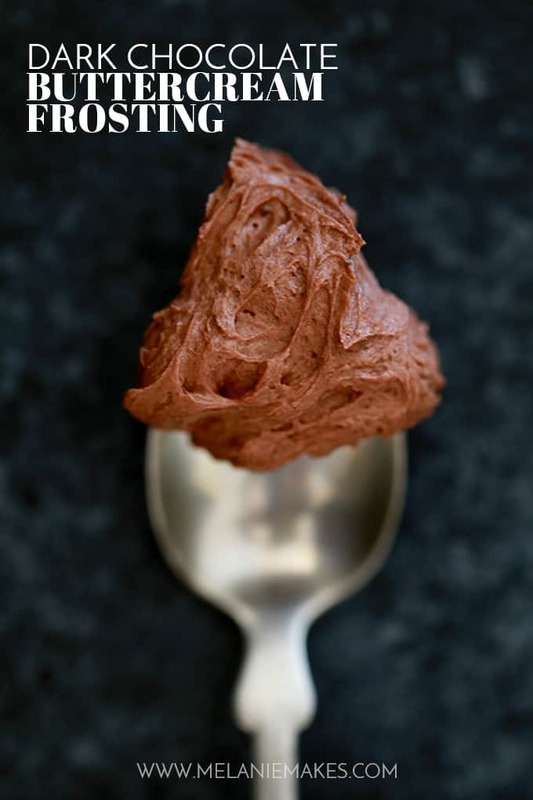 That’s all you need for this decadent Dark Chocolate Buttercream Frosting. It’s my go-to for birthday cakes and bake sales and always gets rave reviews from anyone that tries it. Need a confidence boost? 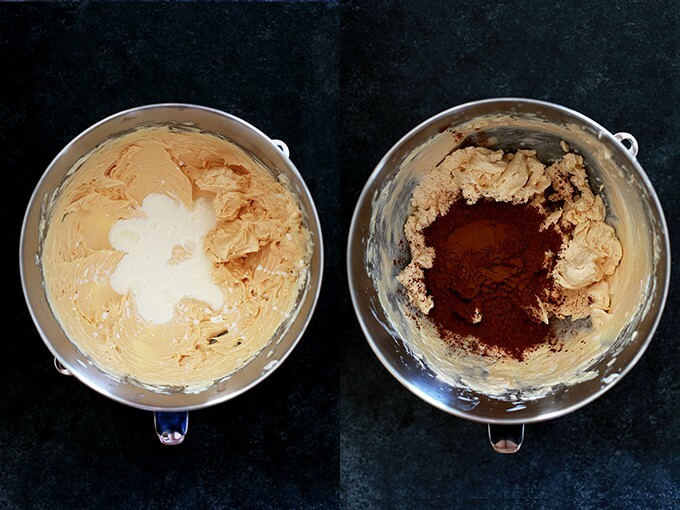 Make some frosting and pass it around to your neighbors. A guaranteed ego boost! Heavy cream, butter, powdered sugar chocolate extract and baking cocoa are all you need to get started. 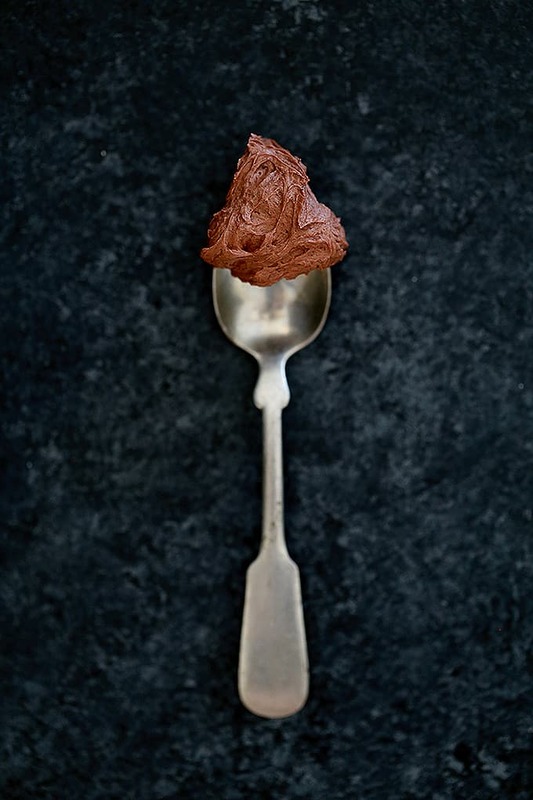 I stock my pantry with Rodelle’s Baking Cocoa and Chocolate Extract as the cocoa is much darker than other cocoa and contains a richer flavor. And chocolate extract? Oh yes, it’s a thing and it’s the secret to adding extra chocolate punch to any baking project. This frosting is the perfect choice for my Chocolate Chocolate Chip Zucchini Cupcakes, Small Batch Funfetti Cupcakes and can even be used on my Double Chocolate Peanut Butter Chocolate Chip Cookie Dough Cake. 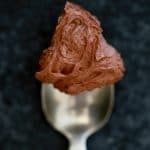 You’ll soon see that if you can pour ingredients into the bowl of an electric mixer and turn the mixer on and off that you’ve got all the skills needed to make this Dark Chocolate Buttercream Frosting. Into the bowl goes softened butter. It’s then beaten until light and fluffy. Next goes in the magical chocolate extract. More mixing. Heavy cream then joins the party. I get a pint of it delivered to our house with our weekly milk delivery and I’m still smitten with the little glass container that arrives and love knowing that it was made locally. Baking cocoa then joins the party and even more mixing ensues. Last but not least, in goes the powdered sugar. And lots more mixing. The end result? Let’s just say I dare you to try to keep yourself from grabbing a spoon and digging in. It really is that good. Servings: 1 Will generously fill and frost a two-layer 9-inch cake or 24 cupcakes. 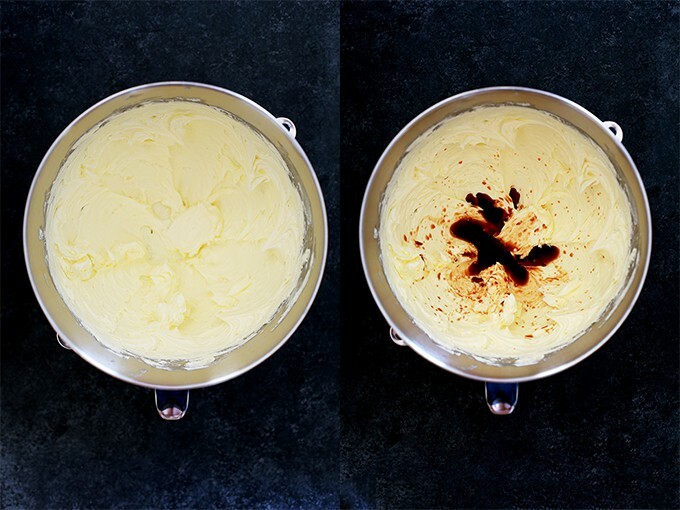 In the bowl of a stand mixer fitted with the paddle attachment, cream the butter until it is light and fluffy. 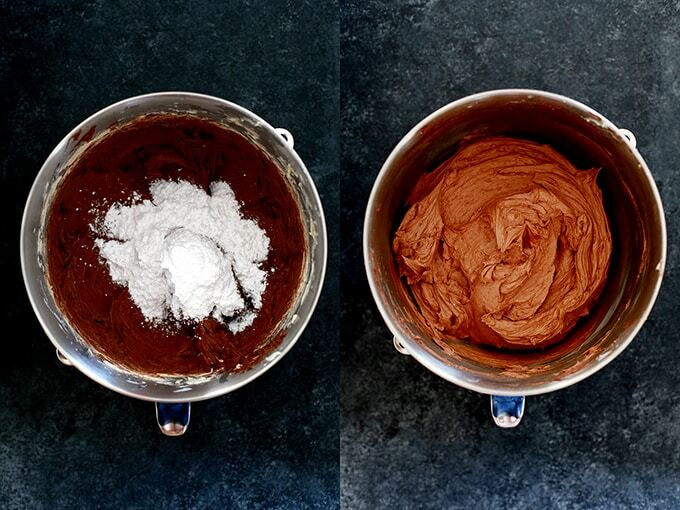 Add chocolate extract and beat until combined. Add half of powdered sugar and beat until well combined. Add heavy cream, remaining powdered sugar and cocoa and beat until the frosting is smooth. Looking for even more chocolate goodness? Look no further! I’m collaborating with a group of food bloggers to bring you Chocolate Week this week. We’ll each be sharing two chocolate recipes with you so that you’re sure to get your fill! You won’t want to miss these Low Carb Chocolate Coconut Truffles, Chocolate Chocolate Chip Pudding Cookies, and Turtle Brownies. I can’t think of a sweeter way to start my week. This would get me in trouble! I want to eat it by the spoonful! Great when I am craving something sweet! This looks delicious! Nothing is better than dark chocolate and dark chocolate frosting sounds super awesome! This is a fantastic recipe- I'll definitely be using it someday soon! I'll have a cup of that : ) Swoon! Oh wow! This sounds fantastic!! Can't wait to try it! This sounds fantastic! I LOVE how easy and delicious this is! Good idea! I really like! Thank you. We're not fans of dark chocolate so I was going to use milk or semi-sweet chocolate til I read the recipe and saw dark chocolate referred to the color. For new bakers please spend the extra change and buy REAL extracts, it is so much better!! Hey, Judy - The dark chocolate is from the amount of cacoa in the cocoa and the extract. The darker the chocolate the better in my opinion! :) Totally agree with you on purchasing the best quality real extracts. This looks so good! Is the giveaway over? I can't locate the giveaway widget even when going to another browser. Thanks! Hi, Vivian - Yes, the giveaway ended earlier this week. Thanks so much for your interest! My girls and I would have no problem digging into this frosting with a spoon in each hand! Looks awesome! I have no doubt they'd love it, Melanie! I love Rodelle vanilla and cocoa...some lucky winner is going to so excited to win :-). I did all of the entries--except two (the Pinterest Pin and the Instagram Like--see my previous comment) After I submitted the comment, the form no longer indicates I have ANY entries (they were there--with a green checkmark--before I submitted the comment). I am discouraged. Any suggestions (I don't want to take the time to enter again if all of my entries will just disappear) Thank you for your time. An entire pound of butter?!?!?! Oh well, everything's better with butter!! Can't wait to try it. Hey, Nancy - This makes a LOT of frosting. Enough to generously frost a double layer 9" cake. That sounds so wonderfully decadent! And the added chocolate extract is perfect for punching up the chocolate flavor several delicious notches! Oh my, this is one incredible frosting!! I love it!! Oh boy, this looks so decadent and luxurious. The perfect cake frosting for sure! I have never used chocolate extract! So interesting! Looks delicious!I can't locate the give away info. I have never heard of this brand and am a chocolate lover! Can't wait to try it! I never met a chocolate recipe I didn't like! ????Thanks! Hi, Sue! The giveaway widget is located just above the recipe. 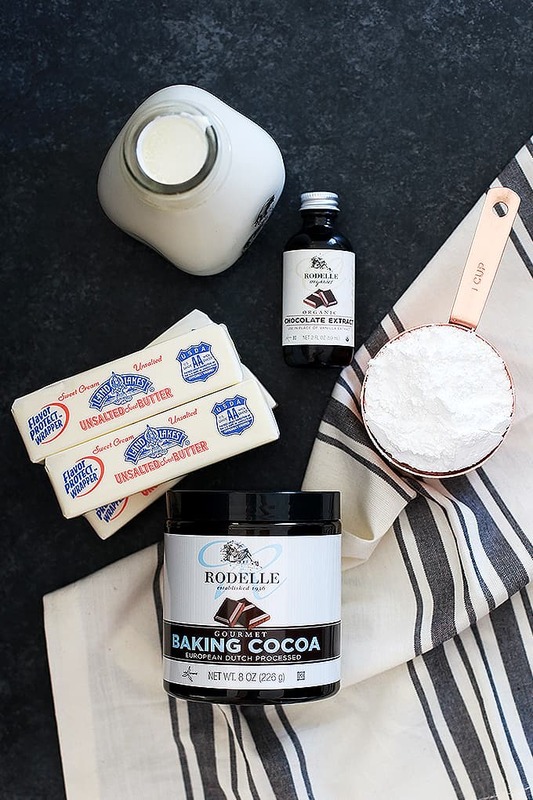 And you must give Rodelle a try - I actually have the baking cocoa on my subscribe and save list on Amazon. It's really that good! I also could not find the widget, so I used a different browser and it was right there. Might be the same issue for Sue. Thanks for the heads up, Sandy!